What you see is what you get. 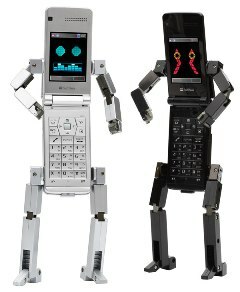 Apparently, these Toshiba 815T PB phones have come in contact with the Allspark Cube from the Transformers movie and now have bodies of their own. Now all they need are guns and missiles like that one crazy Nokia phone. Apparently, this is all part of promo for a new show called Ketai Sousakan 7. To be honest, I don’t know how anyone could make a show about transforming cell phones, but how can you not, really? Especially ones with faces like those. I wonder what the plot will be about. Maybe it’s about cell phones that want to be human. Very silly, really. By the way, these Toshiba 815T PB phones are fully functional as they are 3G network enabled, and come with a 3.2 megapixel camera. All right, those are the facts. Now here comes the part where I make fun of this concept. This time, it is just too easy. Do we need phones that can transform, even if their limbs did work? If so, they had better have more of an Autobot rather than Decepticon streak. So far, there is no set availability date but sometime in April. There is also no set price, and it is predicted that this will only be in Japan. I just hope they don’t destroy the country like in transformers . This device could help or not with our lives. They ROCK!!!!!!!! I’m Japanese &Living in US.